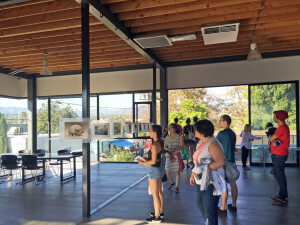 FSY’s creative campus (known as BLOX) buzzed with people during the 10th Annual Frogtown Artwalk on Saturday, August 13. 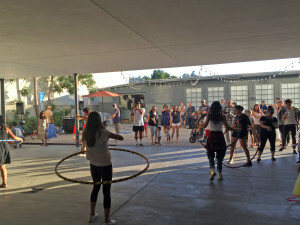 FSY Architects participated in the Artwalk organizing committee and played host as it opened its offices-turned-gallery space, and courtyard-turned-hula-hoop arena, to throngs of folks wandering through the thoroughfares of Knox and Blake avenues. 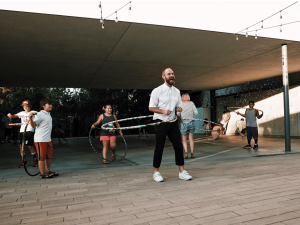 Attendees were treated to artistic works by photographers Grove Pashley and Marisa Montellano and artist Armando Suenos in the second floor FSY office space, while many moved to deejay music in the hula hoop contest downstairs. 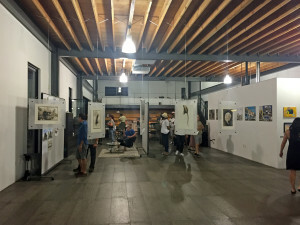 The Frogtown Artwalk has become a key item on the L.A. arts circuit calendar, and draws thousands of Angelenos for a single evening to this community of artists, designers and makers. The event signified how architecture, context and community come together in a seamless fashion to enrich a place in transition.